The TR 502 Tracking Generator operates with the 7L13 or 7L12 Spectrum Analyzer to provide a calibrated rf signal for swept frequency applications from 100 kHz to 1.8 GHz. The output frequency of the TR 502 can be adjusted to track the spectrum Analyzer frequency within 10 Hz. The TR 502, a two-wide unit compatible with the TM 500 Modular Series instruments, is normally used with the TM 503 (Option 07) Power Module. This permits the optional use of a digital Counter such as the DC 508A with Option 07. A bright dot, on the spectrum display, identifies the frequency location on the sweep that is indicated by the Counter. Higher range counters to 1.8 GHz can be used by connecting their input to the TR 502 AUX RF OUT connector. 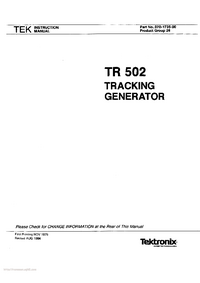 The TR 502 Tracking Generator is a two wide Plug-In unit for the TM 500-Series (Option 7) Power Modules. It operates with the 7L13 or 7L12 Spectrum Analyzer to provide a constant, level-calibrated rf signal source, that precisely tracks the spectrum Analyzer input frequency from 100 kHz to 1.8 GHz. Signal output level is calibrated and adjustable from 0 dBm to -59 dBm in 1 dB steps. The Spectrum Analyzer/Tracking Generator system can be used to display frequency response of various devices such as filters, amplifiers, etc. that are connected between the tracking Generator RF OUTput and the spectrum Analyzer rf input connector. When the TR 502 is installed in a modified three-wide or larger, power module, a frequency Counter such as the DC 502 can be connected to the AUX OUT and used to accurately measure the frequency for any fixed position of span. When the Analyzer is in the non-sweep mode, the TR 502 output is a cw signal and the Counter reads continuously. If a DC 502 Option 7, or similar Counter is used, the TRACKING GEN LOGIC is interfaced with the 7L13 Spectrum Analyzer so operational logic from the TR 502 controls the sweep function of the spectrum Analyzer and the frequency counting of the Counter A dot is displayed at sweep center to indicate where and when the frequency count is taken. The abbreviations, graphic symbols, and logic sym-bology used in the text and diagrams of this manual are in accord and based on ANSI Y1.1-1972, ANSI Y32.2-1970, and ANSI Y32.14-1973 (American National Standard Institute, 345 East 47 Street; New York, N Y. 10017). Change information has been integrated into the manual by goldenrod insert pages at the back of the manual and page revision. Original pages are identified by the symbol @ and revised pages are identified by a revision date in the lower inside corner of the page. If the serial number of your instrument is lower than the one on the title page, the manual contains revisions that may not apply to your instrument. History or backlog information all previously applicable to produced products with the updated data is integrated when the page or diagram is revised. The following describes the sections and information provided in this manual. Section 1—General Information and Specifications: Contains instrument description, electrical specifications, environmental characteristics, accessories, installation, and repackaging for shipment instructions. Section 2—Operating Instructions: Information relative to operating and checking the instrument operation. Section 3—Performance Check: Procedure to check the operational performance and electrical specifications of the instrument. Two-part section provides an incoming inspection type check and a detailed electrical performance verification. Section 4—Calibration Procedure: Describes test equipment setup and adjustment procedures required to calibrate the instrument. Section 5—Circuit Description: Provides basic and general circuit analysis that may be useful when servicing or operating the instrument. Section 6—Maintenance Instructions: Describes routine and corrective maintenance procedures with detailed instructions for replacing assemblies, sub-assemblies, and individual components. An exploded drawing is part of Section 10. Section 7—Options and Modifications: Provides data on production options available. Section 8—Electrical Parts List: Provides information necessary to order replaceable parts and assemblies related to the electrical functions of the instrument. Section 9—Diagrams: Provides functional block diagram and detailed circuit schematics. 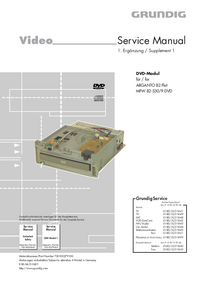 Located adjacent to the diagram (usually on the back of the preceding diagram) are pictorial layout drawings which show sub-assembly and component locations. Voltage and signal level information, if applicable, is included to aid in troubleshooting. Section 10—Mechanical Parts List, Exploded Drawings and Accessories: Provides information necessary to order replaceable mechanical parts. The Parts List is cross-referenced to the Electrical Parts List when appropriate. Exploded drawing shows sequence of assembly and identifies assemblies. 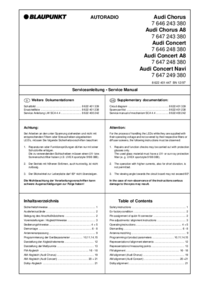 Changes and Corrections: Provides updating information for the manual in the form of inserts. 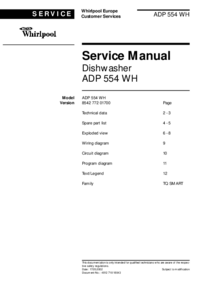 These inserts are incorporated into the manual text and diagrams when the manual is updated.